SellerApp combines product intelligence with insightful analytics to provide you with the data to make decisions within seconds. One dashboard for all your seller needs. SellerApp turns any user into a product research ninja with intuitive features, instant insights, and smarter shortcuts. 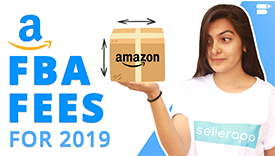 When it comes to your Amazon success, no other Amazon seller tool can match SellerApp’s commitment to helping you find your winning Amazon product. Short of product ideas? Our Amazon Product Database with over 35 million products and counting is the best place for you to kick off product research. Find elusive niches and products with the best sales, highly profitable and low competition. Collecting everyday data from over 35 million Amazon products, touching upon over 300 million data points, our data grows intelligent and smarter each day. Analyze key metrics like the sales and revenue estimates, BSR fluctuations, ratings, for a data-driven decision narrowing down to the best product choice. Cut down discovery time. The top Amazon products chosen with the best-prefiltered metrics, automatically and instantly discover products that check off the major points in your Amazon product research checklist. Put to use the Use Cases in the Product Research Feature to build a list of best-selling products from all the major Amazon product categories, the most trending Amazon products, and the best bundling ideas. Build a product list with just a few clicks. To better analyze your niche, you need to explore your data, cross verify metrics and outliers and choose your pick on your best selling product. SellerApp accelerates your data analysis and helps you disclose winning products from the ease of your chrome browser within a few clicks. Simply click on the SellerApp Chrome Extension and it automatically analyzes your data and presents the most statistically significant results. Unlike most other Amazon tools, SellerApp helps you analyze both the Amazon product results page as well as the individual product pages. Amazon business is indeed difficult, but finding the best product with the right data in your hand shouldn't be hard. SellerApp simplifies every step of the product finding process – from product selection to capturing data and the analysis. Our comprehensive data filters are built just for this. It is no longer hard to drill down and narrow down to your winning product. With unparalleled context and depth into your Amazon data, Product Research could not get easier. Stop missing what matters by keeping a track on what’s important to you. SellerApp keeps you informed about critical changes in the products you track as they occur. Get warning alerts for spikes and drops in the BSR, changes in the pricing, changes in the seller ratings and changes made to improve the listing quality or a decrease in the listing quality. SellerApp Alerts delivers customized and relevant alerts according to what’s important to you so that you'll never be overwhelmed by irrelevant signals. SellerApp is your extra set of eyes and ears. It monitors what's happening for the products that you are interested in. Gain insight into your competitor strategy. You can find out what constant changes are driving the product towards its success. Is it the keywords in the listing, the trends in the market or the quality of the listing that's bringing them the sale. Use this knowledge to react quickly, imitate similar product launches or strengthen up your launch by a better product. We believe the Product Research is pretty great, But don’t just take our word for it…. Become a PPC wizard in less than an hour! Can I get a demo of the SellerApp software? Should I get a separate subscription for each feature? Which marketplaces does SellerApp support?